I'm just bouncing off the walls here on this gloomy Friday afternoon. I am going to see Mark Lipinski of "Quilters Home Magazine" tonight in Lincoln and get this... Little ole' Me will be joining him (and 8 other of his Nebraska Pickles) for dinner! 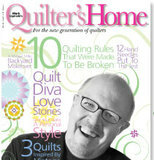 Mark is the owner of a Yahoo group I'm a member of and it is the Funnest quilt guild! Pure guilty pleasure for me, just reading and laughing and occasionally posting. I will be taking my camera tonight as I've been begging for a photo and so far, Mark as been agreeable. We'll see what happens when he finally meets me in person. He also bought 3 bred older cows from a co-worker. They are all Black, Angus I'm supposing. Nice looking girls and not too freaked out by the change. The evening we brought them home they headed for the north side of the pond and stayed there. At least they didn't go through the electric fence like some we bought a few years ago...(yes, Arvin, they were YOURS.). Now several days later, they are working themselves into the herd. They are the bottom of the pecking order but I have a feeling they will not stay there. We also culled out 2 more old cows. Our older mama who's calf died last week and "Short Ears". "SE" had her ear tips and the end of her tail froze off when she was a little thing, but has been a good mama. She even gave us twins about 2 or 3 years ago. But she must be close to 15 years old and it's time. Just like when we took Molly-Cow up to the sale barn...it was hard to see her go. Now we only have "Lucy" left of the named cows. So far she is doing well, despite being the same age as Molly and Short Ears. We drove the Old Mama and Short Ears up to Columbus and stopped to pick up 3 steers from the co-worker we bought the 3 bred cows from. It was an uneventful ride but long and we didn't get home until close to 9 p.m. The poor quilt studio is about as lonely as can be! I've sewn exactly one seam in the last 2 weeks and cut a few pieces but that is it! Sad..sad...sad... I haven't even had a chance to get those bindings on yet. I did start folding one of them over and getting it in place. I bought some 'binder holders' which are just snap close barrette thingies. (there is a better name that eludes me just now) I did this while waiting for the delivery guys to install my washer/dryer/range. Hey!! I don't' think I mentioned that, did I? But shucks... I don't have time now... (LOL) Seriously, I have to get some cookies baked for my Farmer and finish cleaning up the kitchen and fold some laundry, all before 5 p.m. when I have to leave for my Night Out. ** Love is the thing that enables a woman to sing while she mops up the floor after her husband has walked across it in his barn boots.